Sold and Open House links may not be available in your board, if they are they will appear in DaknoAdmin. 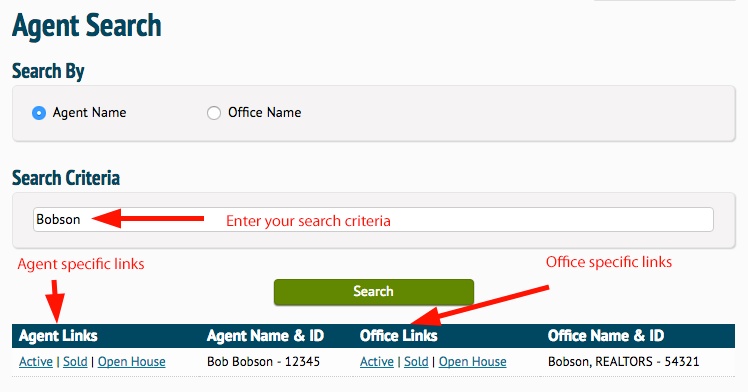 Enter your search options, selecting Agent or Office, and then typing in your criteria. How to use this feature. Clicking on each link will open it in a new window. You can then take that link and integrate it into your website to help visitors see your listings, listings you've sold, or any open houses you may have entered into the MLS, if available.